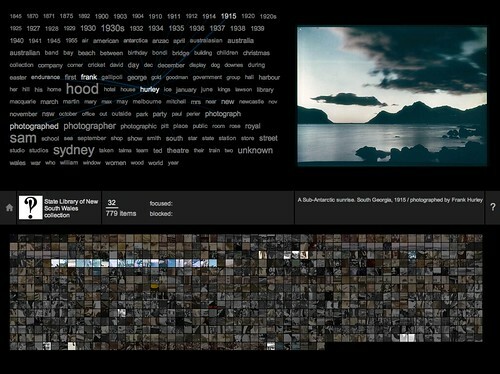 Although the Visible Archive project wound up months ago, its visualisation techniques live on. In particular I've been developing and adapting the title-word-frequency interface of the A1 Explorer, and trying it out on a range of different datasets. One of these spinoff projects - the commonsExplorer - has finally launched. Here, some documentation, reflection and rationale. My colleague Sam Hinton and I began work on this as a project for MashupAustralia late last year. Our initial focus was the Flickr set of the State Library of NSW, and our aim was a rich, dynamic, "show everything" interface, building on the A1 Explorer work, but with image-based content. Some months later, having totally missed our original deadline, the scope had broadened out to the whole (amazing) Flickr Commons. The explorer consists of a three-pane interface. 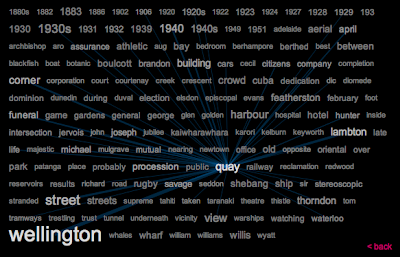 The term cloud shows the 150 most frequently occurring words in the titles (not tags) of the current set of images. This will look familiar to anyone who's played with the A1 Explorer. It uses the same co-occurrence visualisation, and the same blocking / focusing navigation, with a few UI refinements. After some strong user feedback, I added a "back" button to step the navigation back one state. It also uses left and right-clicks, rather than modifier keys, to block or focus words. Applying this title-word approach to different sets has shown up its strengths, and a few weaknesses. Its strengths are that titles and co-occurrence are a reliably rich cue for content, and that for most collections, thanks to the wonder of Zipf's law, the top-level cloud of 150 words will "cover" (refer to) more than 75% of the images in the set - even in a collection numbering in the thousands. Often, in smaller collections, the coverage is more than 95%. One question I haven't answered yet is how to communicate this idea of coverage to the user, and how to make those images not in the top level cloud, more immediately discoverable. Because after all, sometimes it's the outliers or exceptions in a collection, that we are interested in. The bottom pane is the thumbnail grid, which is where most of the new stuff is. 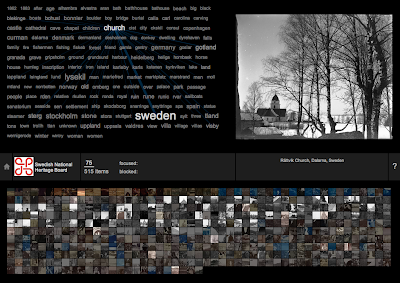 The grid is an attempt at a "show everything" image visualisation that can scale from tens to thousands of elements. As the number of elements grows, the grid size decreases to fit in the available space. Rather than scale images down, we simply crop the thumbnails - the intention isn't to represent the whole image but to provide some rich but unstructured visual clues: a sort of visual core sample through the whole set. The results show how this can help reveal structure within the collection. Different photographic processes are instantly apparent - monochrome, sepia, cyanotype, stereoscopic, Kodachrome. Other similarities also pop out, even in small tiles - landscapes vs portraits, for example. This "clue" approach actually sums up our visualisation approach nicely. The Explorer presents us with a rich mass of partial information - or rather data: linked fragments of titles, and of images. Moments of discovery come when we see those fragments unified in a source image: the fragments are contextualised and become more meaningful. This contextual information then propagates back to the fragmentary display - when it works best there is a feedback loop from discovery to context and back to discovery. I've argued for a distinction between data and information, which is relevant here: these fragments are data points, abstracted and decontextualised. Information occurs only when we link and interpret those fragments - and it happens strictly on the human side of the screen. Another feature of the grid that isn't immediately obvious is chronological sorting. Many collections, including the SLNSW set we started with, include dates in image titles. We look for those dates and sort dated images first in the grid. This approach is simple, and prone to the occasional false positive, but it degrades gracefully, and adds a usable layer of structure to the grid layout. Why not use Flickr's "date taken" field instead? Most Commons collections don't set it, so instead it gives the date uploaded. For the same reason we decided not to use tags, or attempt to scrape data from descriptions: these fields are inconsistent across the Commons - some images have no tags, others have dozens. Title and thumbnail seem to be the richest data that is always available. Sam Hinton did the heavy programming work that makes the grid go. The main technical challenge we faced was memory usage: loading 700 tiny images just eats memory in Processing / Java. Sam devised a system for stashing the square thumbnails locally, optimising memory and acting as a cache to speed up loading. Drawing thousands of little images to the screen also raised performance issues - we draw to a single offscreen PGraphics context, then draw that to the screen. In the end I think we've done what we set out to do - make a rich experience that encourages an understanding of context, and enables discovery in large collections. We've also shown that this approach is broadly applicable - if you've got a large image collection where you think it might apply, let us know. Most importantly though, try it out and let us know what you think.